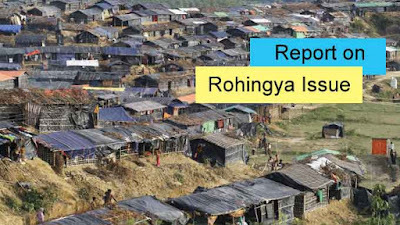 Staff Reporter: Rohingya in Bangladesh refer to the refugees from Myanmar living in Bangladesh. An estimated 8,50,000 to 9,50,000 Rohingya people have fled to Bangladesh since 25 August 2017, to avoid ethnic and religious persecution by Myanmar's security forces. There are more 300,000 Rohingyas living in Bangladesh who fled in earlier violence from the Burmese government over the last three decades. Officially, Myanmar's government does not recognize the Rohingya as lawful citizens. The government claims they were brought to Rakhine from Bangladesh during the time when Myanmar was a British colony, and the government says they are living in Myanmar illegally. The refugees who are living in Bangladesh are suffering from many humanitarian problems. They suffer from food, shelter, water and sanitation problems. Women and children are the worst sufferers. They have no scope to take a bath. For this, they are becoming sick and getting affected by diseases. Now The Government of Bangladesh (GOB) is working closely with IOM and other agencies to establish a new 2,000 acre site. As of now, this site is undeveloped and has no available services or capacity. Site planners and engineers are working on access roads and layout of this large site to allow provision of services. Until then, services and assistance are still required in the spontaneous and makeshift settlements and affected host community villages throughout Cox's bazar. BDclass © 2019. All Rights Reserved. Developed by Abdul Awal Ripon.